The thirteenth book in Baum’s Oz series was called The Magic of Oz. It was published in 1919, one month after L Frank Baum had died due to complications after having a stroke. This story begins with a magician who discovers a simple magical word for transforming anything and anyone into anything and anyone he wishes. The word is complex and must be pronounced exactly, but once learned is very easy to execute. After Ozma declares that only Glinda and the Wizard are able to perform magic in Oz, the magician retires but writes down his discovery in a secret compartment in his magical laboratory. Years later the magician’s son happens upon the secret word, figures out how to use it and escapes his village to do wicked things across the land of Oz. The son, Kiki Aru, joins up with the original Nome King, Ruggedo, who was exiled in Book 3 – Tik-Tok of Oz, to exact revenge on the denizens of The Emerald City, most notably Ozma and Dorothy. The plan involves tricking the animals of Oz to revolt against the Emerald City by convincing them that the people of Oz are going to attack and enslave the animals first. Meanwhile, everyone in Oz is preparing for Ozma’s birthday and Dorothy and like 8 other people travel out into the Oz country side to find Ozma the perfect birthday present. Yeah, I’m not too thrilled with that part of the story. Trot and Capt Bill spend most of their time trying to obtain this magical flower that is floating in this island in the middle of a river in the northernmost part of Oz. Just not very compelling. However, the scenes with Ruggedo and Kiki Aru convincing the animals to attack the Emerald City are pretty good. However, while out looking for presents, the Wizard and Dorothy stumble upon the plan and do their best to stop it. All while Capt Bill and Trot are magically stuck on the island with the magical flower. Oh, and, spoiler alert, Dorothy and the Wizard train a monkey to jump out of Ozma’s cake and dance. That is their gift to her. On her birthday. This is an oddly disjointed book. I liked about half of it. The rest is sort of silly, but in a bad way. Normally Baum is able to make the silly parts endearing, but this time, not so much. I’m not really going to recommend this book, even though we see the return of the original Nome King, one of my favorite Oz characters. It just seems a little pointless and dull. Don’t get me wrong, there’s a lot of imagination and cool stuff to see, but by the end of the book I was a little disappointed. Only one more L Frank Baum Oz book would be published after this. 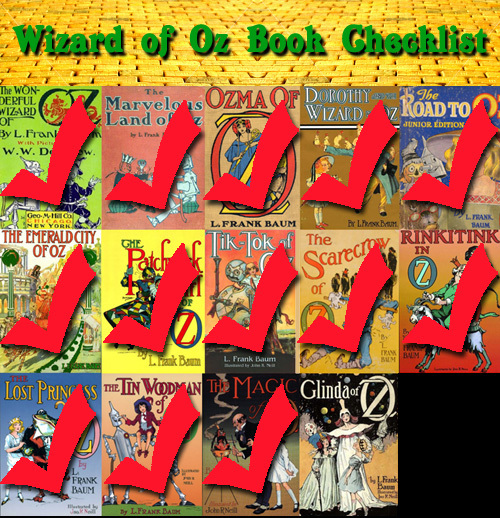 Below is my checklist of Oz books. I’ve crossed off the ones I’ve currently read. Next up is the fourteenth and final L Frank Baum Oz book, Glinda of Oz. This entry was posted on February 13, 2013 at 9:20 am and is filed under books, Classic literature, pop culture, Wizard of Oz with tags book, Book Report, Oz books readthru, pop culture, review, Wizard of Oz. You can follow any responses to this entry through the RSS 2.0 feed. You can skip to the end and leave a response. Pinging is currently not allowed. I intended to create you the very small note to help say thank you once again for your personal great tactics you have provided in this article. This is simply surprisingly generous with you to allow extensively all that a lot of folks would have sold as an e-book in making some bucks for their own end, most importantly considering that you could possibly have tried it if you desired. These smart ideas also acted to provide a easy way to comprehend other people have a similar zeal just as my own to realize lots more related to this matter. I am certain there are several more enjoyable instances up front for many who take a look at your site.